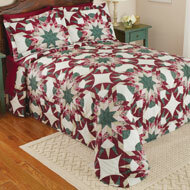 Starburst Vintage Country Bedspread from Collections Etc. 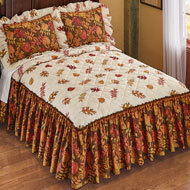 Warm up the bedroom with the gracious look of vintage country handwork.  Charming and affordable, this all-cotton bedspread is accented with a textured starburst design that looks like it could have been created decades ago by a true country craftswoman. Available in sizes: Twin 78" x 108"; Full: 96" x 108"; Queen: 102" x 118"; King: 118" x 118". Machine wash. Imported. Specify Color: Cream, Lavender, Sage Green or Yellow. Love, Love my new bedspread. 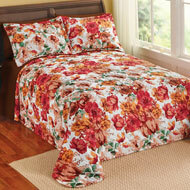 I have been trying to get one of these bedspreads for a long time. I just love it and it is so warm. I ran it through the dryer a couple of times just to get all the loose fuzzies off. - AK, Az. Returned bedspread to you for a refund. - Judy the gal, Modesto Ca. I bought this beautiful bedspread for my wife's upcoming birthday. I know she will go crazy for it. Thank you. Daniel of Nebraska. - Daniel of Nebraska, Lincoln Ne. I really would get this again. Just what I have been looking for !!!! The bedspread is comfortable and fits the queen bed nicely. I had no complaints with Service and delivery. All went well on this order. - Kaye, McHenry, IL. Acceptable quality for the purchase price. Looks nice on bed - n/a, Haw River, N. C.
It was a heavier material than I expected, I should get lots of years of use. - dee, long beach, ca. Color was dull. Returned it. Was not the color that was stated. I bought this for my father in law he liked it in the book but when we opened it it was so thin you could see everything under it not worth the money and not what expected looked better in the picture in the catalog he was snd i was disappointed we sent it back for a refund it needs to be thicker than what is is then it would be nice.sorry - Angie, Mcgaheysville va.